Scientists have shown that low-level soap contaminants in rivers and estuaries can block social recognition in fish and cause their shoals to break up, impacting on their ability to avoid predators and to locate food. Since shoaling is the primary defensive strategy used by many fish - it works by 'confusing' predators and preventing them from singling out an individual to attack - this has huge potential implications for the day-to-day survival of fish. With nonylphenol, an extremely common aquatic contaminant found in virtually all soap products, concentrated in rivers and marine estuaries, where fish nurseries are typically found, the negative impact on breeding stocks potentially becomes more pronounced. The research, which was led by Dr Ashley Ward from the University of Sydney's School of Biological Sciences, is published in Proceedings of the Royal Society of London B, in a paper entitled 'Scents & Scents Ability: Pollution disrupts chemical social recognition in shoaling fish'. 'Chemical contamination of aquatic environments is a problem in many parts of the world. Early legislation to control this was based on studies of toxicity - how much of a given chemical is required to kill organisms,' said Dr Ward. 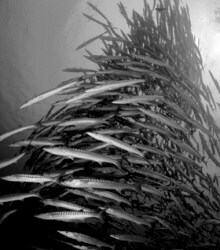 'Fish make extensive use of chemical cues for social recognition - much of their social behaviour is mediated by these cues,' said Dr Ward. 'It seems that nonylphenol, and chemicals like it, block the ability of fish to communicate with one another and this causes the shoals to break up. The most worrying thing is that we saw these effects at very low concentrations - exactly the sorts of concentrations that we might expect to find in rivers near human settlements,' he said.